Croteam is preparing Serious Sam for another encounter in the summertime. Can we get serious for a moment? No? Sorry, but you'll have no choice when the summertime rolls around and the most serious franchise that isn't serious at all launches a brand new title. Croteam has announced that Serious Sam 3 will hopefully be out in summer 2011. "Just a quick note to let all Serious Sam fans know that Serious Sam 3: BFE is coming this summer 2011," Croteam CEO Roman Ribaric wrote on the company website. "Official announcement will be released soon." The "BFE" acronym is currently a mystery. Croteam's Serious Sam series resides in a unique place in the shooter genre. It's part Duke Nukem, part blow the crap out of hundreds of enemies at a time, and it's always looked gorgeous thanks to Croteam's Serious Engine. The Serious Sam games have a simple gameplay style, but they're really fun. 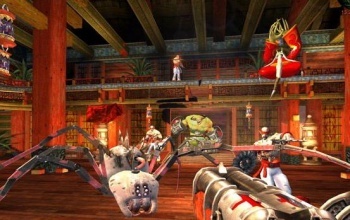 Players try to save the planet by engaging in some of the most hectic battles of any shooter, using parrot bombs and gatling shotguns. At times, you may find yourself rewarded for playing basketball. I'm not joking. No details on gameplay have been provided yet, but Serious Sam 3 will likely make those battles even crazier with Croteam's Serious Engine 3. Trying to survive will definitely be a serious matter.